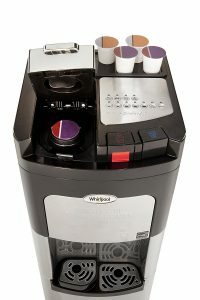 The brand new, late 2017 release stainless steel Whirlpool Coffee Maker and Water Cooler is the self cleaning and bottom loading type and compatible with different beverage types of Keurig K-cups. As this is a two-in-one product you will not have to purchase a water cooler an a coffee maker separately and will help you save in both money and space. Silver and black Whirlpool Water Cooler weighs 60 pounds with the measurements of 16 x 46 x 17 inches. It has a sleek and modern design, looks nice and attractive in stainless steel and will fit wit your house or office decor very nicely. You can use a standard 5 gallon (19 liter or 640 oz) water bottle with it as well as a smaller three gallon one. 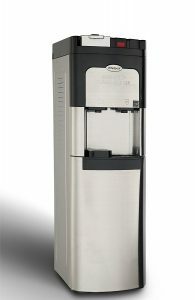 The commercial coffee maker has probably the largest possible water tank available for single serve brewers on the market. It lets you choose from three different cup sizes of 6, 8 and 10 ounces. It makes coffee pretty quickly too: The 10 oz cup (295.7 ml) in 43 sec, 8 oz cup (236.6 ml) in 37 secs and the 6 oz cup (177.4 ml) in 32 secs, or 295.7 ml. As the most of what’s in a coffee cup is water, you want a good tasting and pure, filtered or spring water to enjoy a better tasting coffee. You can actually make four cups of coffee without having any pause for recovery. And with 5 Gallons of water you can make 80 cups of coffee on average. This water dispenser model has the convenient self cleaning feature by the unstable oxygen killing harmful bacteria in the water tank that may contaminate your water. This way water will stay clean, healthy and taste fresh. The LED indicator will tell you when the self cleaning is running. You do not have to descale the hot water tank every month like you may with some other model water coolers but just once a year or so. This is because of the great Featherheat technology that heats the water gently without accumulating any calcium deposits. There is a removable drip tray that helps prevent mess or water leaking all over your floor. And by removing it you will have enough space for your tall travel mugs and even bottles. The coffee making unit brews coffee at a consistent 201 degrees Fahrenheit or 94 degrees Celsius, which is the widely recommended optimal coffee brewing temperature. By getting to temperatures up to 15-16 degrees C more than other single serve brewers, you will achieve a strong aromatic coffee with a developed taste and beautiful rich flavor. The typical temperature levels reached by regular water coolers are usually not hot enough to make good coffee. Please note that you will get hot and cold water with this model and not the room temperature. So you just pour some water into your glass and let it sit for a while. As this is a stainless steel product it can show the stains and finger prints, so just keep a rag nearby. Manufacturer claims that this coffee maker is suitable for commercial use and you can use it in offices, cafes and restaurants without having much break. It comes with the patented Thermoregulator technology that keeps the cold water at the very cold 4 to 5 degrees Celsius and the hot water between 90 and 94 degrees Celsius. There is a LED indicator that tells you when water temperature reaches its hottest and coldest. Whirlpool is a well-known brand for water coolers and this one appears to be great value for money overall but we will find out more when customer reviews start appearing online. © 2019 Justnewreleases.com. All rights reserved. Justnewreleases.com is a participant in the Amazon Services LLC Associates Program, an affiliate advertising program designed to provide a means for sites to earn advertising fees by advertising and linking to Amazon.com.